Sewing Machine Manuals are very important to have because if you have a function on your machine that you don’t know how to use or something is not working properly, checking your manual usually gets you sorted out and sewing again without having to drag your machine off to the service store for assistance. There was a time there that I had to get my manual out every time I did a blind hem just because I couldn’t remember which way to fold the fabric but I’ve taken up so many hems now, I think I could do it blindfolded! I also get my serger manual out whenever I oil my serger because there are so many spots I need to put the oil that I don’t want to forget one. But what do you do if you have misplaced your manual or bought a used machine without the manual? No problems, just jump online and ‘Google’ it. The first place to search is your manufacturer’s website as they usually have a support page with Frequently Asked Questions and Troubleshooting as well as links to manuals for all their machines that you download and save to your computer. I recommend printing out a copy and keeping it with your sewing machine for easy reference next time you need it. Usually these manuals are free so if you’ve lost your manual or never had one, take the time now to download it and print it out as the time invested now may save you heaps of frustration tomorrow. 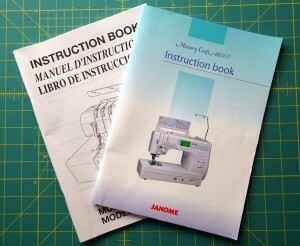 http://www.sewitworks.com – has a list of major sewing machine manufacturers, plus instructions on how to download manuals from their websites. It also has helpful information on needles and basic troubleshooting. http://www.sewusa.com – has information on how a stitch is actually formed, adjusting thread tension, threading various machines, quite a range of manuals and troubleshooting. Hi Rosie. .I keep my manuals in the cabinet with the machines and, even after 36 years, I’m still finding settings I haven’t used. Kayla was given an overlocker from a Deceased Estate with no manual and we were able to find one just as you described. I’m sure your information will be a great help to any one who misplaces their’s as well..so easy to do, especially if you move house.